Corpus Callosum: The brain is divided into the right and left hemisphere. Corpus callosum is a thick band of nerve fibers that connects the right and left hemisphere of the brain, allowing for communication between both hemispheres. The bundle of nerve tissue of corpus callosum carries over 200 million axons by rough estimate. This neural tissue helps communication among the two sides of the brain. The corpus callosum transfers sensory, motor, and the cognitive information among the brain hemispheres. 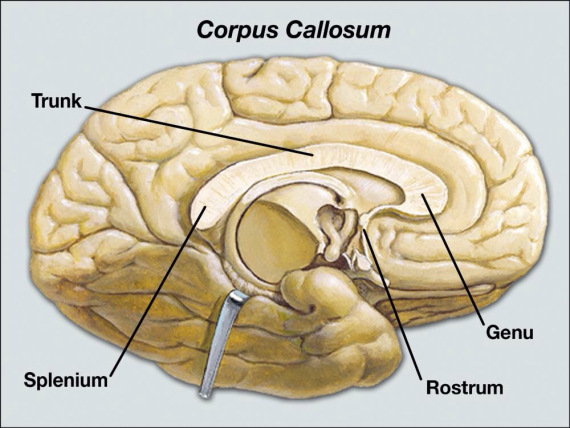 The corpus callosum can be separated as the rostrum, genu, body(trunk), and splenium. The rostrum and genu join the left and right frontal lobes of the brain. The body and splenium combine the hemispheres of the temporal lobes including the hemispheres of the occipital lobes. The thickest part of the corpus callosum is known as the splenium which is located the posterior end of the corpus callosum near the cerebellum. The splenium overlaps the tela choroidea of the third ventricle and the midbrain and ends in a thick, convex, free border. A sagittal section of the brain reveals that the posterior end of the corpus callosum is sharply bent forward, the upper and lower portions remaining connected to each other. The anterior end of the corpus callosum which is near to the frontal lobes is named the genu ("knee"). The genu is bent downward and backward in front of the septum pellucidum; decreasing quickly in thickness. The anterior end of the corpus callosum is continued backward under the rostrum and is attached below with the lamina terminalis, which extends from the interventricular foramina to the recess at the bottom of the optic stalk. The anterior cerebral arteries are placed under the surface of the rostrum; the anterior cerebral arteries arch over the front of the genu and are moved back over the body of the corpus callosum. The body of the corpus callosum is within the splenium and the genu. A narrowed segment connecting the body and the splenium is identified as the isthmus of the corpus callosum. On each side of the corpus callosum, the fibers expand in the white matter and reach to the numerous parts of the cerebral cortex; curving front of the genu within the frontal lobe form the forceps anterior, and those bending back toward the occipital lobe. Connecting these two parts of the body of the fibers which compose of the tapetum and continue laterally on either side within the temporal lobe, and cover in the middle part of the lateral ventricle. The anterior commissure and tapetum share the function of correlating the left and right temporal lobes. Thinner axons in the genu join the prefrontal cortex among the two halves of the brain; those fibers originate from a fork-like bundle of fibers of the tapetum of the forceps anterior. Thicker axons within the midbody of the corpus callosum, interconnect regions of the motor cortex, including proportionately more of the corpus callosum committed to supplementary motor areas including the Broca's area. The posterior body of the corpus, identified as the splenium, communicates somatosensory information connecting the two halves of the parietal lobe including the visual cortex at the occipital lobe of the forceps posterior. 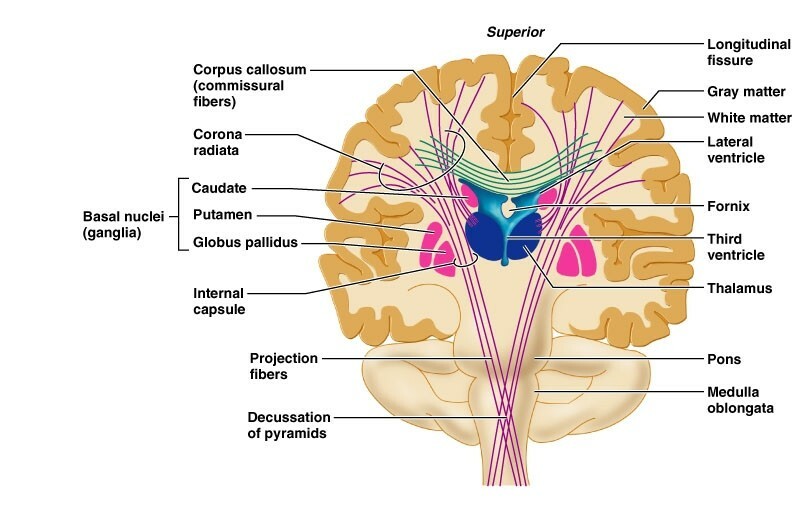 The corpus callosum performs a significant role in vision by connecting the separate halves of our visual field, which process images individually in each hemisphere. It further enables us to recognize the objects we see by correlating the visual cortex with the language centers of the brain. In extension, the corpus callosum assigns tactile information within the brain hemispheres to empower us to locate touch.